You cannot put blame on Gravity for falling in love but you can surely pick on it for the discomfort you experience during a Yoga session. If this sounds half-baked to you, then you are at the right place at the right time. Yogis and rigid believers of the monotonous practices may not fully agree with the fact that practicing Yogic moves on a mat is not a friendly thing to do. You cannot defy Gravity and neither can you overlook the impact it might have while you do inversions or forward bends. From walking past your favorite shop to weight lifting and ending at you sleeping on your favorite couch, everything is managed and governed by the Gravitational force. Learning how to manage the poses and what impacts you go through are important for you to reap the maximum benefits. When you perform a physical task, your muscle undergoes broadly two types of contraction processes – Eccentric Contraction and Concentric Contraction. Eccentric contraction is the elongation of a particular muscle(s) in the presence of some kind of negative force or strain. This results in a notable deceleration of a particular body part in action. The latter is more of a contraction process happening in a positive environment and resulting in the acceleration of the body part in action. In all these cases of contractions, the Central Nervous System sends a quick signal to one of the protein filaments present in your muscles known as myosin. Therefore, it is important to identify the amount of force exerted during a Pose versus the resistance towards the force induced. There will be a lot of muscle talk here because Yogic poses not only strengthens your muscles but also tests them at all levels. Consider performing Plank Pose or Kumbhakasana, your muscles involved in performing the pose successfully goes through Eccentric contraction. This means that the force exerted on your arms to hold the pose is greater than the normal ones like poses involving raising your legs. Even though, staying in the Plank Pose makes the triceps stronger, you need to be aware of the fact that overdoing poses involving eccentric moves might lead to a significant loss of muscle proteins and as a result painful muscle soreness. The medical journals call it as DOMS or Delayed Onset Muscle Soreness, which can stay longer if the Yoga sessions are not performed on alternate days. Everything from running to shifting the chair from one to another to doing Warrior Pose, it is the Center of Gravity that govern the moves. Leonardo Da Vinci was the first person to discover the significance of this factor in daily life and named it as Propulsive Force. Later, the theory was given a new dimension by Thomas Graham Brown, which stated that center of gravity tends to move forward and downwards under the force of Gravity, during any movement. So, how does it apply to your Yoga Pose? Consider vrksasana, your pelvic area is shifted slightly towards the left as you stand sturdily with your hands folded and smile on your face. 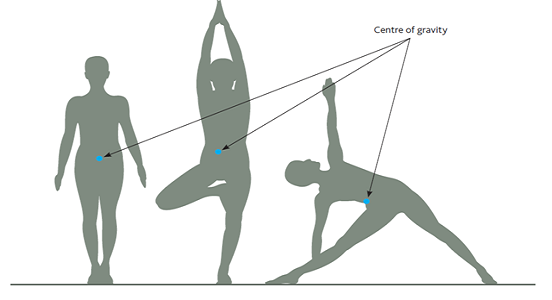 The shift in the position of pelvic might not be a forceful act but rather a demand of balancing your center of gravity. If you do not make this move and stay strong to balance yourself on a straight body, the muscles in your legs and your spine shall go through the might of the Gravitational force. This is more of how gravity reels you in to do things that are right for your body. First thing first, it is time to bust a big myth in this very moment and it will hurt. For decades, people have been blindly following the information linked to inversions and blood flow. It is believed that poses like Headstands or handstands increases the blood flow towards the brain and makes way for more blood in this area. It is time to shun this notion and understand that your brain is not an empty bucket ready to receive some fresh blood. There is a well-devised mechanism surrounding your brain that regulates the amount of blood reaching the area so that there is no chance of artery damage. However, you must know that poses like Headstands or Sirsasana lets you defy the force and do some favor to your facial skin, for sure. There are other functions like circulatory system that receives a lot of benefits from these poses and their actions that goes against the gravity. In normal poses or situations in life, gravity exerts a pull on your skin, spine, and muscles, so now you know why your skin sags with time. Definitely poses that go against the gravity affects your physical and emotional health in profound ways but make sure to not overdo it. Understanding the mixed bag of results one may have doing poses and playing with Gravity, there is something new in the market called Aerial Yoga. Search online and you will see pictures of Yogis balancing themselves on strings or hammocks in the air. This is a counter gravity Yoga style that lets your muscles relax and your joints have a better space between them in order to avoid uncalled friction.